Volatile, disruptive, disquieting: the value of instability is a highly debatable topic. It’s important to distinguish two categories of perceptible and imperceptible instability because transparency plays a big role in being able to anticipate and help facilitate its effects. Perceptible instability is a great indicator for premeditated change, while imperceptible instability is a sleeping tiger - impossible to predict and capable of uncontrolled mayhem. I was five when I became viscerally aware of this later kind of instability for the first time. The Loma Prieta earthquake rocked San Francisco, my home, and my sheltered childhood connection with the world. The memory of that experience was implacable. Yet time and the joys of living in one of the most beautiful cities in the world appease San Franciscans who choose to live in a constant state of imperceptible instability. I don’t blame them. In fact I look forward to joining them again one day. But at the moment I'm living in a city with an instability of the opposite extreme. Mumbai is a city of in-your-face volatility. Along with 16 or so million other people, I’m aware at any moment of the precariousness of life and the perception that chance is the deciding factor of one's destiny. Yet the upside of this awareness is the idea that anything is possible. Sociologist and urban theorist, Saskia Sassen, who came to Mumbai to speak at a Studio X conference in December, says this makes Mumbai “a city of the future”. 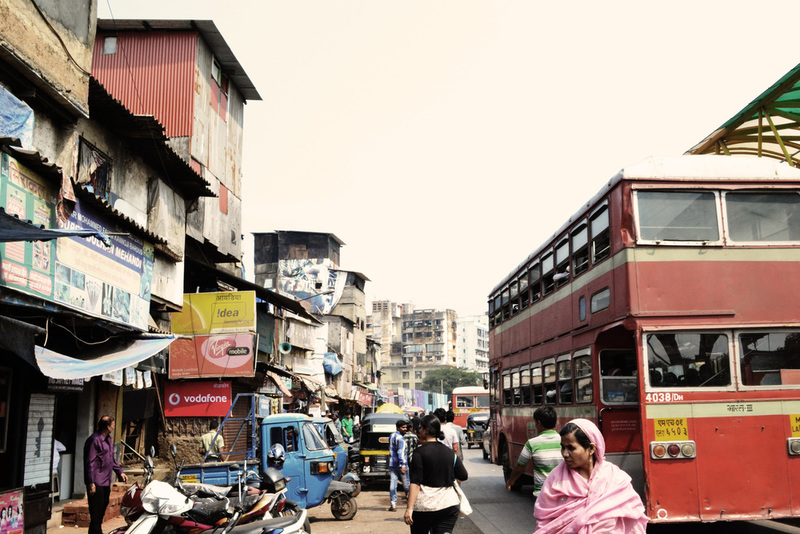 The embedded nature of Mumbai’s social vitality, production, goods distribution, and services within the public realm of the street is a condition that resists the de-urbanisation precipitated by privatized developments and the enclosure of central authority structures. Old silos of social class, have’s and have not’s, and static binaries of public and private are being dissolved in what she calls the street, where opportunities for new forms of the social and the political can be made. Uprisings in the Arab world, the spread of Occupy Wall Street, daily neighborhood protests in China's major cities, Latin America's piqueteros are extreme examples of this. Sassen argued that the destabilization of static meanings is creating an opportunity for a “new geography of privilege and disempowerment to cut across the old divide of rich and poor countries.” In the street, the disempowered and marginalized are in control. If the bottom 50% of the city stopped working for one day, for example, Mumbai would be brought to her knees. Of course this is a catch 22 because the number of quality large-scale civic infrastructure projects and public planning initiatives do not equal the intensity of use and congestion that the streets are experiencing. There is a mismatched development agenda here as the private market drives most of the development in the city with little or no incentive to build public works projects. Fully inhabited buildings are falling apart in the very shadow of brand new high rises under construction. Since the rent control act of 1947, thousands of buildings in the island city have been neglected, straining under the destructive effects of heavy pollution, salt air, over-occupancy, and the abdication of owner responsibility to maintain the property. These buildings remain untouched relics of another architectural era; dying and decaying yet alive with activity and reappropriated uses, contributing to the contradictions of modernization in urban India as represented in Mumbia’s perceptible instability. But if structures don’t fall down and systems remain operational through the earthquake does it really matter if a city is getting rocked? Is this state of perceptible instability just another way to think about the permutation of our urban centers around the developing world according to elasticity and the rate of adaptation? A well-designed structural mechanism is based on this. In fact, it depends on it. Reinforced concrete systems, for instance, are designed with the understanding that significant portions of the structure will eventually become visibly cracked. The cracks are vital indicators of when the steel reinforcement is engaged as a pre-warning for premature shear failure of the entire system. This perceptible instability can last for decades and be closely monitored and corrected before compromising the overall integrity of the structure, and in fact is quite stable. In other words, a well-designed system is one designed for the failure of its primary members. In the current state of globalization we might say our primary structures are failing. Stable meanings have become unstable: “banks”, the “economy”, the “environment”, “power countries”, “rich” and “poor”, “the middle-class”; these concepts still exist but we don’t necessarily have a language that effectively captures the political transformation they are undergoing. For a country founded on stable meanings and the power of individuals, the effects of this transformation are not insignificant. I’m not talking about India anymore. The US is experiencing a pedagogical transformation evident in the severe deadlock of the government’s strategies way forward. But from one very large experiment in democracy to another, I’m going to make some very general observations that pertain to a subject outside the scope of my expertise but crucial to the understanding of urbanization in the developing world because the challenges faced in the urban growth in the developing world are not necessarily that much different from the challenges beginning to be faced in the US. Not that San Francisco is beginning to look anything like Mumbai… But did you know that the equity gap in the US is higher than India? America just does a better job at hiding it. But now perceptible instability is leaking through the cracks of a failing global economy and into the lives of many hard working individuals who grew up with a different idea of what their adult life would look like. It’s at a point where we can’t dismiss it as a struggle faced by the developing world. One of the most significant indicators of this transformation is the rise of homelessness in the US. Over 9 million families have lost their homes in the US since the late 2000s. Since 2008, thousands of “tent cities” (http://www.mirror.co.uk/news/world-news/in-the-us-today-youre-on-your-own-753586) have cropped up around the country with the support of municipal governments and local organizations. These are middle-class members of the greatest democracy in the world waiting for the system to call them back. The difference here in Mumbai is that the homeless don’t wait. There is no system to call them back. They are makers, doers, and survivors. In both cases, the urgency of the situation supports a very important point: that capitalism and socialism need to learn how to get along under the same roof. In the US, we’ve had the privilege to associate “making” in with self-advancement, facilitated and protected by the constitution and bill of rights. But in a capitalist society lacking the social and political infrastructure to balance the distribution of wealth and opportunity, “making” for many means making ends meet. There is hardly a middle class in India because the majority of “makers” are below the poverty line and have figured out a way to survive like this with little or no cost to the government, in addition to little or no opportunity for upward mobility. The point is: it's complex. But a more pointed point I'm trying to make is that it’s time the government and private enterprises starting working together to acknowledge the social and economic contribution of the “weakest” members of Indian society and recognize that the way out of economic decline is to develop economic models to help transform their assets into live capitol. For instance, incorporating even a percentage of slum dwellers into the formal city by granting land tenure would instantaneously generate massive equity with little or no cost to the government. Perhaps the capitalist-heavy leaning toward “survival of the fittest” needs to be redefined into a new way of evaluating global success as “survival of the weakest”. Perhaps resiliency needs to be the standard by which we evaluate the growth and livability of our cities where perceptible instability has become the status quo.